STREET FOOD VENDING CARTS, HOT DOG CARTS, Espresso Coffee Carts, Mobile CATERING FOOD VENDING CARTS. Please contact these vending cart supply companies directly for more information about their cart products or food carts they may offer. Ben’s Hot Dogs Saved My Life – Called the Hot Dog Vendor’s Bible, this book will breakdown the entire business to simple terms, from choosing the right carts and the best locations to satisfying government regulations and best industry practices. Included are trade secrets and how to get the most value out of every cost. Includes Ebook, and FREE Video Training!! 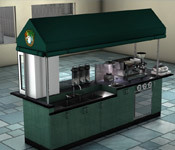 CoffeeCartBiz.Com builds the most professional and elegant espresso cart businesses. All Coffee carts are built to your specifications, with step-by-step help from our design team. Our espresso and coffee carts are known for their durability and elegance while still maintaining a user friendly appeal. Cambro Food Vending Carts and Kiosk Systems available with canopies or umbrellas. Our carts hold a surprising amount of food. These carts are completely portable and do not require electricity. Mid-size carts and kiosks have insulated compartments to keep Food hot or cold. Utility Trailers also available to transport your vending carts. Click to see our complete line of (Vending Carts).